Happy accidents. We had been hoping to see Martin Carthy at 5.45 in the ARC Tent, but unfortunately he withdrew. He has just had a minor operation and needs more recovery time. 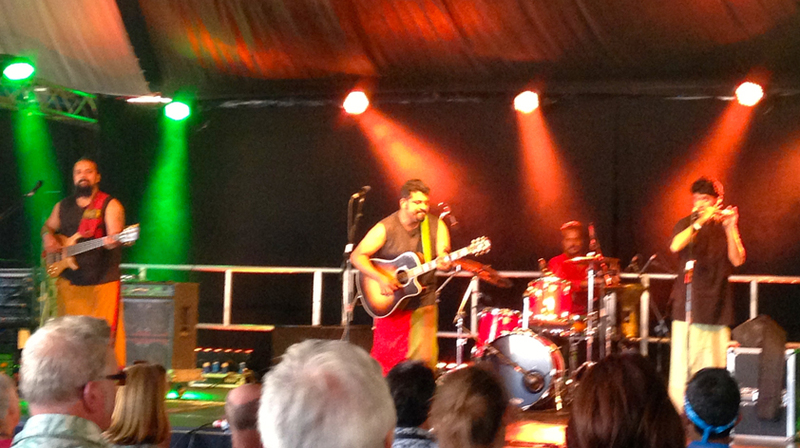 Raghu Dixit had already done a set on the main stage earlier in the afternoon (which we missed), and were asked to do a second set to replace Martin Carthy in the ARC tent. The programme listed them as “Rajit Dixie” which made me think of Hayseed Dixie doing bluegrass versions of classic rock. Was this to be an Indian version of classic C&W perhaps? Maybe a touch of The Night They Drove Old Dixie Down with sitar and tablas? But it was just a spelling error. The man’s name is Raghu Dixit. He’s been on Jools Holland Show (2012), was a download phenomenon, and this was his sixth gig in five days. The people around us had been to their earlier set on the main stage and assured us we were in for a treat. We certainly were – this guy has played Glastonbury, and many music festivals, drawing crowds of 100,000 in India. We had the intimacy of the ARC tent. He asked how many people had seen the earlier set … lots. ‘Damn! We’ll have to find different songs!’ he said. I’m sure they have plenty. Honestly, I had never heard of him! 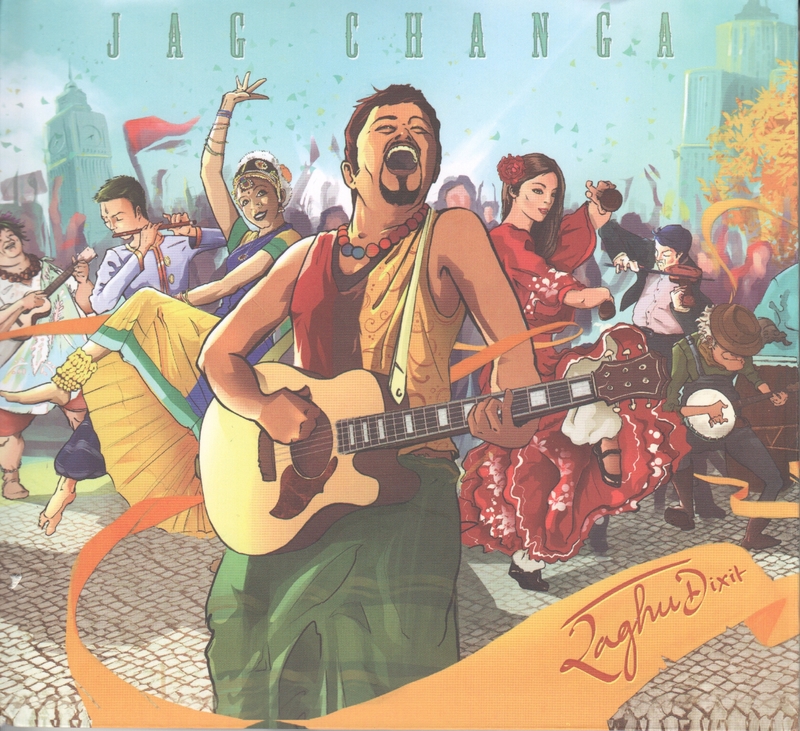 Raghu Dixit describes his music as Contemporary Indian Folk Music. He is a singer-songwriter, producer and film composer from Bangalore in India. The tracks on the latest album Jag Changa are in Hindi, Kannada and Tamil, but don’t ask me which was which. Andy Mellon of Bellowhead plays trumpet on one track. The instrumentation is conventional Western. I’m not sure I’d play electric guitar with bare feet, but they all did (as well as all wearing long skirts). With an electric guitar and a mic, I would like a rubber sole between me and the stage. I applaud their courage … and Raghu had ankle shakers too. As with Jimmy Cliff later, the bass player used a 5 string bass, and had a crunchy clear sound. That’s such a change and a bonus. The lead guitarist made his Les Paul sound like Carlos Santana. Titles are an issue. I didn’t get them in the first draft of this, so many thanks to Gaurav for giving me the titles. They took great care setting up their sound balance. His voice is fabulous, and he has a warm and lively personality. He got people dancing in the first number and again in the last two. I’d describe it as rock in a foreign language, though the flute solos were very Indian, and as well as the Carlos Santana sound, there was a sinuosity to the lead guitar and the drummer had a hand drum attached to a conventional kit. So we didn’t understand a word, but loved it all. Lokhada Kalaji was a superb ender. Think Graceland, sweet soul, salsa and excitement. Electrifying electrified music from India … and festivals like the Larmer Tree are about discovering something new. We also discovered Amsterdam female trio Snowapple in the previous set. Sort of Pysch-folk. So good I bought a CD, but having missed nearly half the set, I won’t review them. Thanks, Guarav – I bought the CD so I had identified Jag Changa and Lokada Kalaji – I’m really enjoying the album. Highly recommended. My joking comment on bare feet shows my age – it was dangerous in the 60s and 70s, but electrics on stage are so much safer now.